There are many factors to consider when trying to reduce your risk of heart disease. It is important to keep your cholesterol levels and blood pressure under control, but both can be high without ever causing any symptoms, so it is important to get tested often. Your heart rate or pulse can also point to the health of your heart, as a high heart rate can be caused by a high cholesterol level. Since heart disease is a serious condition, it is best to have regular checkups and talk to your doctor about your risk. The heart muscle is responsible for supplying the body with the blood and oxygen it needs. To do so, it must contract or beat a certain number of times per minute. As the heart pumps blood through the body, pressure is created in the blood vessels, which you can feel as your pulse. If you are under stress or exercising, your pulse is faster, as the heart must work harder to meet the demands placed on the body. When you are resting, sleeping or meditating, the pulse is naturally slower. 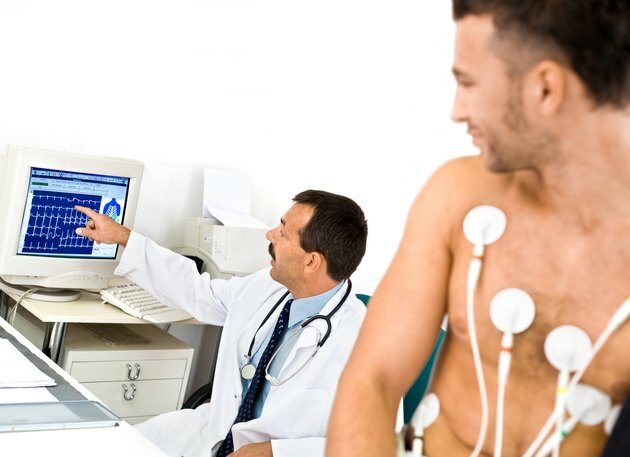 A normal pulse for adults is 60 to 100 beats per minute, but an athlete's pulse may go as low as 40 beats per minute. If your pulse is faster than normal, it may be a sign of an underlying medical condition such as heart disease. Cholesterol is a waxy substance that the body makes, and it is also obtained through food. The body needs some cholesterol to survive, and not all types of cholesterol are harmful. Since cholesterol cannot dissolve in the blood, it must be transported by carriers. One type of carrier is low-density lipoproteins or LDL, which takes cholesterol to be stored in the body. The other carrier is high-density lipoproteins or HDL, which takes cholesterol to be excreted. LDLs are considered the bad kind; it is best to keep your level at less than 100. HDLs are considered the good kind, and you want to raise your level to 40 or higher, notes the Texas Heart Institute. High cholesterol levels can exist without causing any symptoms, so it is important to get tested regularly. A general recommendation is to have a fasting cholesterol test every five years unless your physician suggests otherwise. A high cholesterol level is a major controllable risk factor for heart disease, a heart attack or stroke, reports the American Heart Association. When your LDL level gets too high; plaque can build up along the blood vessel walls, which can cause the blood vessels to become hard and narrow. This can lead to a condition called coronary artery disease, or atherosclerosis. This hardening of the blood vessels can restrict blood flow to the heart and or brain. When less blood is able to get through the blood vessels, the heart must beat faster to deliver enough blood and oxygen. This can lead to a higher pulse and higher blood pressure. A fast pulse may or may not be accompanied by symptoms such as dizziness, trouble breathing, chest pain and weakness or fainting. Any of the above should be discussed with your physician. While it is important to lower your LDL level, it is just as important to raise your HDL level. According to MayoClinic.com, HDLs act as scavengers picking up cholesterol and taking it to the liver to be excreted. A high HDL level can slow plaque buildup along the blood vessel walls, which in turn can lower your risk of heart disease. While plaque buildup that already exists may not be reversible, making healthy lifestyle changes can stop it from getting worse and can keep your pulse under control. Eating a diet low in fat and cholesterol; getting regular exercise, maintaining a healthy weight and quitting smoking are all parts of an overall heart-healthy plan. Is a Cholesterol Level of 240 High? Can HDL Cholesterol Be Too High? How Are Lipids Transported Through the Body?